The center part of the comparator shows grain-sizes in the sand-size range. These sizes are listed in three ways. The first method used lower and upper case letters to refer to sand sizes. Here, vc stands for very coarse, c for coarse, m for medium, f for fine and vf for very fine; L stands for the lower limit and U for the upper limit. 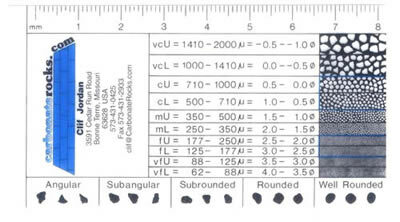 For example, vcU is the upper limit of very coarse sand; vfL is the lower limit of very fine sand. The second series of measurements shows the size range in microns. For example vfL sand ranges in size from 62 to 88 microns. Note that 1000 microns equals 1 millimeter. Thus, Cu sands range is size from 710 microns up to 1000 microns (or 1 m).